A well-placed nuclear explosion could actually save humanity from a big asteroid hurtling toward Earth, just like in the movies, a new study suggests. Scientists at Los Alamos National Laboratory, a U.S. Department of Energy facility in New Mexico, used a supercomputer to model nukes’ anti-asteroid effectiveness. They attacked a 1,650-foot-long (500-meter) space rock with a 1-megaton nuclear weapon — about 50 times more powerful than the U.S. blast inflicted on Nagasaki, Japan, to help end World War II. "Ultimately this 1-megaton blast will disrupt all of the rocks in the rockpile of this asteroid, and if this were an Earth-crossing asteroid, would fully mitigate the hazard represented by the initial asteroid itself," Los Alamos scientist Bob Weaver said in a recent video released by the lab. In the 3-D modeling study, run on 32,000 processors of the Cielo supercomputer, the blast went off at the asteroid’s surface. So the nuke likely wouldn’t have to be deposited deep into a threatening space rock, a dangerous job Bruce Willis and his astronaut crew tackled in the 1998 film "Armageddon." Weaver stressed that nuclear bombs would likely be deployed only as a last resort, if an impact loomed just months away. And other researchers caution that a nuclear blast might have negative side effects, such as sending a hail of many small space rocks toward Earth instead of a single big one. 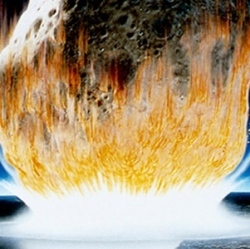 If humanity had more notice of an impending impact, there are several other asteroid defense strategies we might be able to employ, scientists have said. For example, we could send a robotic probe out to rendezvous and ride along with the potentially dangerous asteroid. The spacecraft’s modest gravity would exert a tug on the space rock as the two cruise through space together. Over months or years, this "gravity tractor" method would pull the asteroid into a different, more benign orbit. We have the know-how to pull off such a mission. Multiple probes have met up with rocks in deep space, including NASA’s Dawn spacecraft, which is currently orbiting the huge asteroid Vesta. And in 2005, Japan’s Hayabusa probe plucked some pieces off the asteroid Itokawa, sending them back to Earth for analysis.